Windows system does not gives you sound and audio suddenly or despite sound card or audio device is present and working previously? Windows XP, 2000, NT, 2003, Windows Vista, Windows 7, Windows 8, Windows 8.1 or even Windows 10 computers may lost Windows audio and system sounds output due to the mess on file system or registry that created or left by third party utilities after installation and uninstallation, or corrupted and missing codecs, a component necessary to decompress and decode media files so that can be playback by Windows system. When the Windows no sound problem occurs, the symptoms include users do not hear any Windows system sound even though the volume control on speakers have turned on, and all audio mixers and EQs is not muted. Users cannot hear sound from mouse start navigation clicks, Windows startup sound, messenger’s user online or incoming message notification alert and etc. Even Flash video clips hosted on YouTube, Google Video, Dailymotion, CNet Video, MetaCafe, and etc will not output the sound, even though video playback fine without problem. If you have no sound problem only on Flash objects (video on Youtube, Flash games and etc), try out the Flash no sound registry fix, especially on wavemapper registry key. Else if you try to uninstall and install drivers again, restore to previous system restore point, changing sound card or switch it to another PCI slot will not solve the no sound problem. Here is a simple trick to fix Windows system no sound problem. The trick works by using a tool built into K-Lite Codec Pack. Download and install K-Lite Codec Pack version from here. You can deselect most components that you don’t need, except Codec Tweak Tool under the Tools section. Alternatively, you can just download the Codec Tweak Tool from here. After installed, click on Start button, then go to All Programs -> K-Lite Codec Pack -> Configuration -> Codec Tweak Tool. 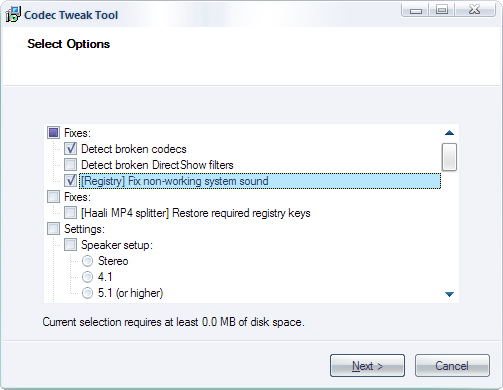 In the Codec Tweak Tool window, tick the check box next to [Registry] Fix non-working system sound. Click on Next button, and your Windows no sound problem should be fixed, and working as usual.